First, The Whipstick Knitters delivered our donations to the Seaman’s Church Institute on Monday. I made three of the forty-four knitted items from us that will be given to merchant seamen and women in the month of December, along with 16,000 more from other folks around the country. Yay, knitters! and look how much yarn was leftover! The pattern is Wendy’s Feather and Fan Sock, and it’s a nice, easy-to-work pattern. The yarn is Regia Crazy Color. They have since been washed, and are a wee bit big. I think I’ll scrub them down some in size , just the foot part– since they aren’t superwash, that should be doable. Washed, they aren’t as silly at the top. I cast on for a scarf with the luscious Silk Maiden that I got in Victoria this summer. I am one of perhaps ten knitters in the country who had not made a drop-stitch scarf, so that’s what I did. And look how much yarn was leftover! I may turn this scarf into something else someday, so I just worked those ends into the scarf without cutting them off. Do you think I should block it? I picked the next-to-last batch of apples and made applesauce. 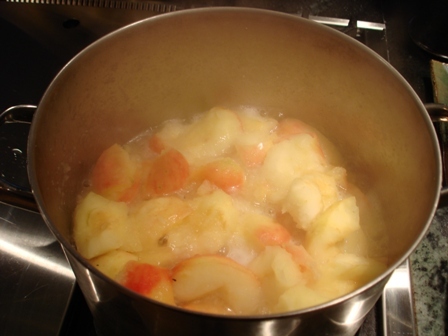 So simple — just simmer quartered, cored apples with a little water until soft, then puree in the food processer. I ladled it into freezer bags and they’re now frozen stiff, awaiting mid-winter applesauce cravings. I started making a costume item for the play my daughter’s in –here’s the preliminary pinning. Any ideas what it’ll be? Comment lines are now open . . .
A nice article in today’s Seattle Times about the Nordic Knitting Conference at the Nordic Heritage Museum this weekend. No, I’m not going, even though I’m a member of the museum and probably got a notice that would have allowed me to make a priority reservation. I will try to get down there to get the booklet of patterns, though. The yarn isn’t here yet, but I won’t get frantic about lost shipments until Saturday. My father-in-law is visiting, and we’ll be busy doing family things, so it’s not like I’d have time to dye sock yarn anyway. The traveling socks are almost done. Whew! I’ve been setting up my Etsy store with some of bamboo blend yarn I’ve dyed, and that’s a job, let me tell you. I think I’m getting it down to less than half an hour per item to do the listings — of course there keep being interruptions like helping my daughter with her activites resume for her college application, and figuring out and installing iTunes since someone was nice enough to send us an album via iTunes, etc, etc. The normal rainy Sunday sort of thing. Anyway, the store is now up and running, although with just a few items, as I’m still peering out the window waiting for the main supply of superwash wool yarn to arrive. Most of them you’ve seen before, and some you’ve seen still haven’t been listed, like the Robin’s Egg skeins, but Sno-Cone, Bamboo Forest, and the Island Dreams fraternal twin skeins are new to you. Here they are, clowning around in the photo studio while the other skeins wait patiently. For a year when I wasn’t planning on traveling much, there have been a lot of quick trips here and there. A couple of weeks ago I went to California to visit my mother, who lives in Tujunga, which you may never have heard of, but which is northeast of Burbank, which you have probably heard of. Here my traveling sock enjoys the view from the back yard. Here’s Mother with her assistants Michelle and Martin. The pictures of us all enjoying lunch always had someone with their eyes closed. We took a trip to the Getty Villa in Malibu, passing within spitting distance of Crazy Aunt Purl in Encino-adjacent, not that I’d do that. Nice view, eh? This is looking from the walkway to the museum from the parking structure. That blue thing in the background? Pacific Ocean. The Getty Villa was built to house J. Paul Getty’s collection of Greek and Roman antiquities, and opened in 1974. It’s inspired by a Roman villa that had a really bad day in Herculaneum in AD 79. The main courtyard garden features a long shallow pool and the covered walkways on either side have murals of garlands of flowers and fruit. This garden is planted with culinary and medicinal herbs. All the landscaping is done with Mediterranean varieties of plants. Inside are rooms filed with statues, jewelry, and pottery, but no knitting. Despite that, if you have some free time in the LA area and plan ahead, it’s well worth your time. Those billionaires do know how to make something pretty.